My husband and I are made for each other. We’ve met 12 years ago (I feel old!) in a train (another story to come) and we’ve been together ever since. We do have a lot of things in common and we both have similar passions, but we couldn’t be more different at the same time. I’ll better show you a few examples. We both like the sea and would have a holiday at the seaside. We both don’t like sunbathing, so we have this in common. Hubby would love a warm place, with a warm sea and he would swim and, after he would be bored of that, go for a scuba dive or something similar. I would go for a swim in a pool and after that… for a walk on a beautiful place like South Stack Cliffs in Anglesey or Northern Scotland, Iceland or Antarctica (amazing landscapes, so beautiful, but a cruise there comes with a few thousand pounds price tag). We both like rooms and houses with a statement. We both don’t like a plain houses or the affordable range of new builds. I prefer period houses (picture is from Attingham), with charm and character and beautiful embellishments, while hubby loves a modern house, a high end new build, with big windows. I would also love to live in a small cottage with exposed beams, nice and cozy. We both love nature and we like plants. While hubby loves the green ones and I do prefer the stronger colours. When I saw this 2 plants in Bodnant Garden I told hubby: this is us. We both like scones, a thing we have in common. But, I like them with clotted cream, hubby likes them with whipped cream. 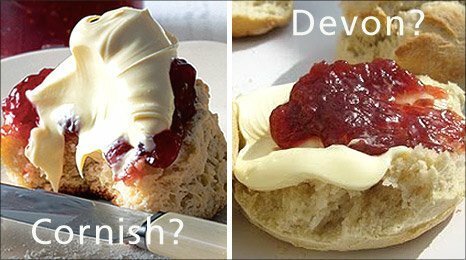 After a few months or trying both ways to eat them, I like the Cornish style and hubby, obviously, prefers the Devon style. You and your husband sounds adorable, and you’re definitely made for each other! I like my scones both ways!